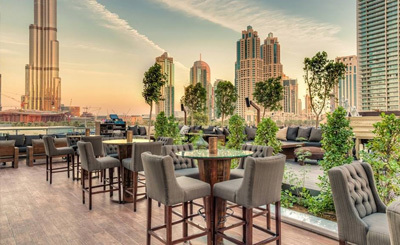 One of the most elite properties in the Burj Khalifa district, Taj Dubai is known for its unique architecture and ambience. 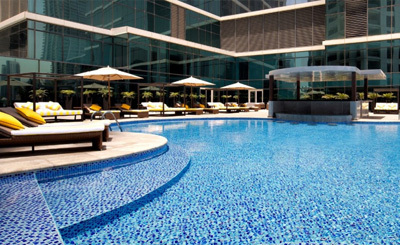 In close proximity with the city’s most famous attractions, landmarks, the Taj Dubai is situated in a prime location. Located nearby are the world famous dancing fountain and the tallest building in the world, Burj Khalifa. 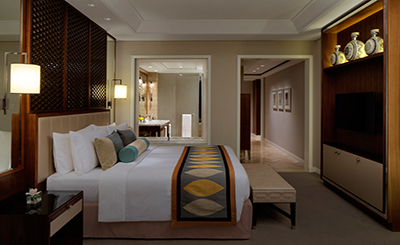 The Taj Dubai is ideal for business or leisure travellers with its comfortable living space and ample amenities to ensure that the guests have a good time. Byzantium Lounge :- Plush upholstered chairs make for a relaxing spot to while away an afternoon with a wide selection of teas and coffees. Tesoro :- Dine in style in this striking Peruvian restaurant housed within an eye-catching glass and metal conservatory. Elegant Elephant :- Soak up the relaxed atmosphere of this friendly neighbourhood gastro pub. 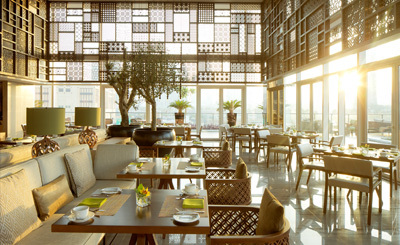 Elegant Elephant offers menu of international classic dishes. Bombay Brasserie :- Serving modern Indian cuisine, where guests can watch their food prepared in the tandoor oven or ‘sigri’ grill. Guest Rooms are warm, contemporary and well-appointed with floor to ceiling views of the city. Ideal for business and leisure, the room features a king/twin size bed, a 42” LED TV, in-room safe, tea & coffee facilities. The elegance extends into the en-suite bathroom with double sinks and bathtub, hairdryer and luxurious Molten Brown toiletries. Guests benefit from complimentary Wi-Fi, in-room bottled water, complimentary newspaper and daily turn down service. 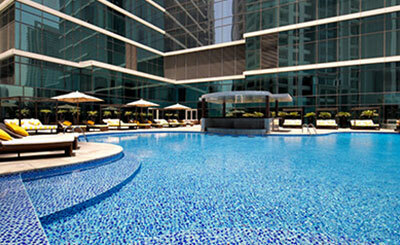 Taj Club Rooms offers stunning vistas of the world famous Burj Khalifa. The rooms offer Butler service, access to the exclusive Taj Club Lounge on the 24th floor that serves breakfast in the morning through to evening cocktails, private Taj Club boardroom for meetings. Taj Club Rooms are 45m2 featuring a king/twin bed, a 42” LED TV, in-room safe, tea & coffee facilities, en-suite bathroom with double sinks and bathtub, hairdryer and luxurious Molton Brown toiletries. Junior Suites Offering all the benefits of a Taj Club Room, Junior Suites are more spacious and additionally feature sofa-beds which also make them great family choices. These suites with magnificent views of Burj Khalifa offer individually appointed spacious suites with king size beds, separate living room, dining room, bar areas and a fully equipped kitchen or pantry. Living rooms offer a media hub connected to the flat screen LED TV. 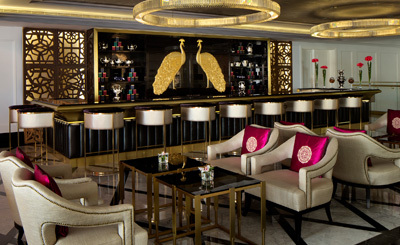 The suites offer full access to all the benefits of the Taj Club Lounge. The Maharaja Suite is reminiscent of palatial India from the times of the royals and maharajas. Decorated with traditional Indian motifs and handicrafts, this highly individual suite is located on the 33rd floor with stunning views of the equally regal Burj Khalifa. The suite offers a gracious living room, large private outdoor terrace, master bedroom with attached bathroom and dressing area, dining room with pantry and all the benefits of the Taj Club Lounge.